Intel could be about to produce a mobile CPU which uses AMD’s Vega graphics technology, according to the rumor mill. This speculation stems from a leaked Intel slide posted by Wccftech with a caption that reads ‘Vega Inside, Mobile Performance Outside’ suggesting that we could see a mobile processor which has, well, Vega graphics inside. First off, note that this potential move has to be taken with a truck-load of salt, but the theory is that Intel might look to incorporate AMD’s Vega tech with either Coffee Lake-H – the next series of mobile processors following on from the current 8th-gen (Kaby Lake Refresh) models – or Cannon Lake-Y CPUs (due later in 2018) which are truly next-gen as this architecture marks the shift to 10nm. The latter would seem more likely, purely in terms of timeframe if nothing else, but of course this is all pure speculation. 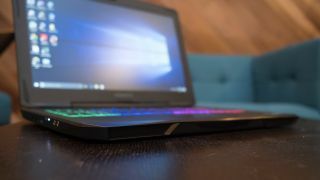 The leaked slide could even simply refer to discrete Vega graphics in Intel-powered notebooks, although the way the caption is worded doesn’t suggest that, and certainly makes it sound like integrated AMD graphics. Wccftech suggests that Intel could plump for an on-die MCM chip design utilizing a multi-die interconnect bridge to allow for a high-bandwidth connection to the GPU, particularly as this is technology Intel talked up in a recent keynote. Adding further weight to this rumor is the fact that we’ve previously heard speculation along these lines; there was talk of the prospect of ‘Intel Radeon graphics’ last summer. And this move certainly seems like a good way for Intel to juice up its mobile processors in terms of their raw pixel shifting power, providing a lid can be kept on any thermal issues (i.e. overheating, which is an ever-present problem when it comes to cramming more powerful components into laptops). All that said, we have to be realistic at this point, and bear in mind that this leak does look rather sketchy, being based off a single rather blurry slide. Meanwhile, it shouldn’t be long before we see Ryzen mobile CPUs with integrated Radeon Vega graphics, so we can get an idea of how powerful these might be – although benchmarks have already been leaked on that score.